Download File: "Home Broadband in Los Angeles County"
The Connected Cities and Inclusive Growth (CCIG) project seeks to map inequities in broadband infrastructure and digital skills in greater Los Angeles, and explore their socio-economic determinants and consequences. This policy brief is the first project publications, and reports findings on the availability and competition in residential broadband services in Los Angeles County at the block level. 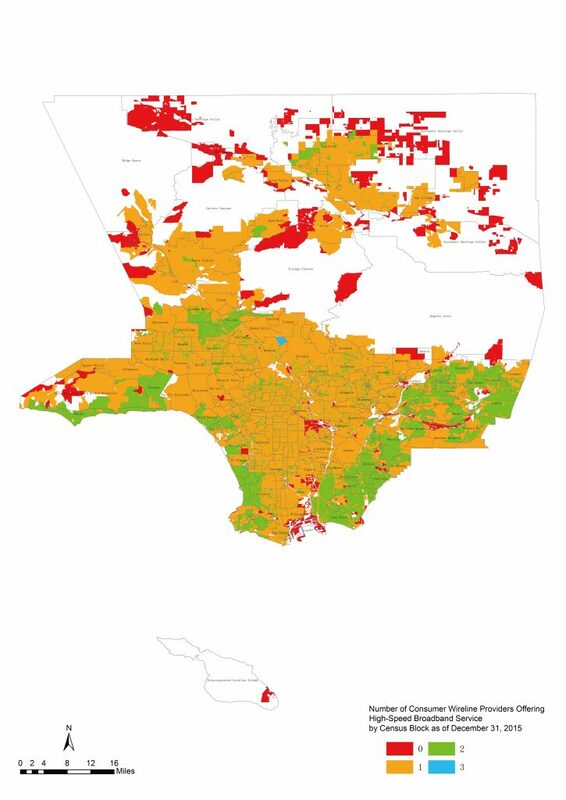 The findings reveal that the vast majority of LA County residents are serviced by at least one broadband provider. In other words, there are essentially no broadband deserts in the Los Angeles region. On the other hand, weak competition appears to be deterring the roll-out of next-generation network infrastructure, particularly in areas where, due to affordability and other barriers, expected demand is relatively low. Two-thirds of LA homes have no choice for high-speed broadband (as defined by the FCC). All else equal, weak competition is associated with higher prices and lower incentives for product quality upgrading. A renewed effort must be made to create a world-class broadband infrastructure throughout LA County that meets the needs of its businesses and residents.